For information to be included in this section, please contact Zahra Majma at zmajma@nbmedia.com. 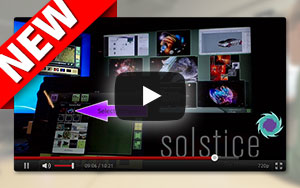 BTX and Mersive bring you this visual collaboration demonstration video to show the power of Solstice — collaboration software like no other. Full line of collaboration and multimedia furniture. With Breeze Digital Signage, forget about software upgrades, server maintenance, downtime, IT configuration and security hassles or clunky software. Enjoy the Breeze!Learn More. Draper“Draper Video Conferencing Backgrounds create a professional videoconferencing presentation no matter where you are.”Description: Instantaneously switch between cameras and other video sources, with the new BrightEye NXT series of Compact Routers. No Pops, no glitches - even with a mix of HDMI and SDI gear. New, from Ensemble Designs. Matrox MuraControl™ for iPad® — Transform your iPad into an intuitive touch-panel interface to control your video wall. Matrox MuraControl™ for iPad is a free app that lets you manage video walls powered by Matrox MuraTM MPX Series capture & display boards. On a simulated video wall displayed on your iPad, drag, drop, and tap on windows to create unique media configurations. Add, remove, or resize multiple inputs within a layout… or switch instantly from one previously-saved layout to another.